The principal of a new £15.8m college campus said he hoped the investment in a deprived area would attract future developments. 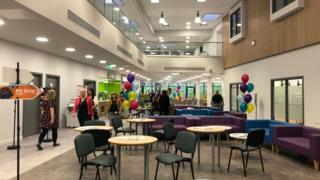 Gloucestershire College's new site in Cinderford, in the Forest of Dean, is part of a wider regeneration project for the former mining area. In August, the town was chosen as the site for a new £11m community hospital. Principal Matthew Burgess said: "It's a big message that, actually, stuff can get done in the Forest of Dean." Cinderford has been in decline since the 1960s when demand for coal from industry was reduced. It was further isolated in the railway reforms introduced following the Beeching Report. The area has since relied heavily on tourism and leisure centred on the Forest of Dean.